General Hospital Spoilers: Will Liz Tell Jason the Truth? This week on General Hospital, will Liz finally come clean to Jason? GH Spoiler: Sam Confronts Liz!|Sam finally confronts Liz about knowing who Jason was long ago.|Sam confronts Liz, pretending to know more than she really does as she accuses Liz of what she suspects: that Liz knew who Jason was long before he found out the truth. Sneak Peek: Sam Confronts Liz! Sam confronts Liz, pretending to know more than she really does as she accuses Liz of what she suspects: that Liz knew who Jason was long before he found out the truth. Patrick assures Emma of their future with Sam. 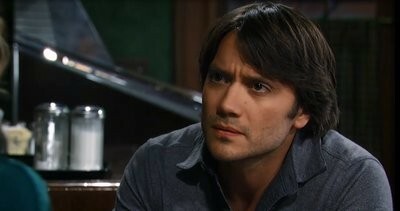 Valerie asks Dante to disclose his intentions. Lulu makes a deal with Johnny. Robin's failure results in her living on borrowed time. Morgan gets reckless with his meds.